Oh it’s been a while since we’ve been to a boot sale. I was well behaved today, the only things I wanted to find were Topsy and Tim books we don’t have, and Finding Nemo on DVD – anything else would be because it made me feel nostalgic. We got Finding Nemo! I’ve got to check it actually plays, for £1.50 I’ll be happy if it does as H asks to watch it a lot. We also got Shrek 1 and 3 (the copy of 2 I found was a DVD-R so I skipped it). They were both bargains at £1 each. 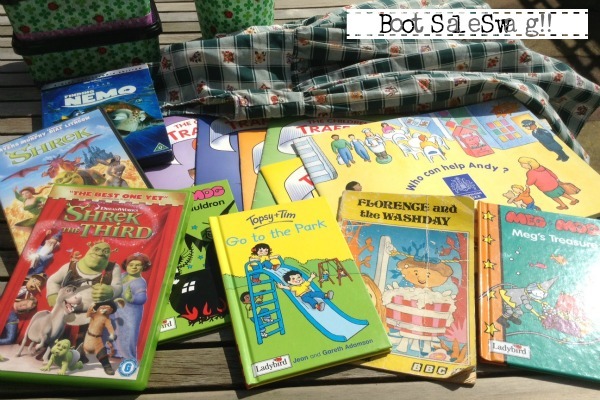 Book-wise we got two Meg & Mog books and one Topsy and Tim – one we picked up at our library recently so I was pleased to get a copy – all three books came in at £1.20 total. A man had loads of Children’s Traffic Club books – I wasn’t sure if it was the same characters as the ones we’re working through at the moment, and indeed they are (just from several years ago) – he gave me six of those books for nothing! I picked up some wooden furniture pieces for H’s #operationdollshouse project which is coming along well. My favourite has to be this final one though – I found a 1970’s Magic Roundabout book – Florence and the Washday – one you read along with and talk about the pictures – proper old school Magic Roundabout – none of this modern ‘Flo’ nonsense. 20p. Twenty-whole-pence. I kept it in my bag the entire day. I might let H have it…. Anyway, I’m pleased with my haul, some good bargains and not too many books, plus we came away with things we set out to get.